But no. It’s not you. It’s not even me. It’s Google. I mentioned last year that my CB-6000 Tips and Tricks page had been slowly but steadily attracting more traffic to the site. I surmised that this might be due to an increase in general interest on the subject of chastity. Well, the party’s over. Well, maybe not over, but it’s not as much of a party as it once was. Well, maybe “party” is the wrong metaphor to use in any case. Well, why don’t I just show you the stuff? Not very hard to see where the drop-off happened. However, that doesn’t look like a natural decrease. Something, I thought, must have changed suddenly and drastically. It was the Google. Last year, I was the third result listed organically when searching for “cb6000.” Today, I’m not even on the first page. A link to the tips and tricks aren’t found until the second page. So, for all you nascent interactive marketers out there, the difference between being on Google’s first page of results versus the second is…pretty big! It cut 75% of the traffic that page was getting. On the one hand, you know, whatever. No skin of my nose. On the other hand, it’s somewhat concerning to see real content (inasmuch as I can refer to my site as “real content”) being replaced with a bunch of redundant shopping links and videos. This is all the apparent result of Google’s new “Hummingbird” search algorithm which they put into service sometime in September. I won’t pretend to know all that that entails, but the results are pretty clear. The kind of content bloggers produce (at least when it comes to locking up penises in clear plastic) is not as valuable, Google surmises, as shopping links and videos. Bonjour, tout le peuple Français! The kind of content bloggers produce (at least when it comes to locking up penises in clear plastic) is not as valuable, Google surmises, as shopping links and videos. I’m not surprised that this is happening; people often wonder how web businesses make money, and the answer is: advertising and marketing. I’m sure that ties into the recent issues about Blogger webpages being shut down for explicit content, and it wouldn’t surprise me if even WordPress knew about this and that’s why they pulled the same thing recently. Yeah, if you search “cb6000 tips” in Google, my page is the first hit. But most of the traffic coming to the site from Google is various incarnations of “CB-6000.” That’s where I dropped. That search you did — cb6000 tips and tricks — should definitely land here, but for whatever reason, Bing hates me. 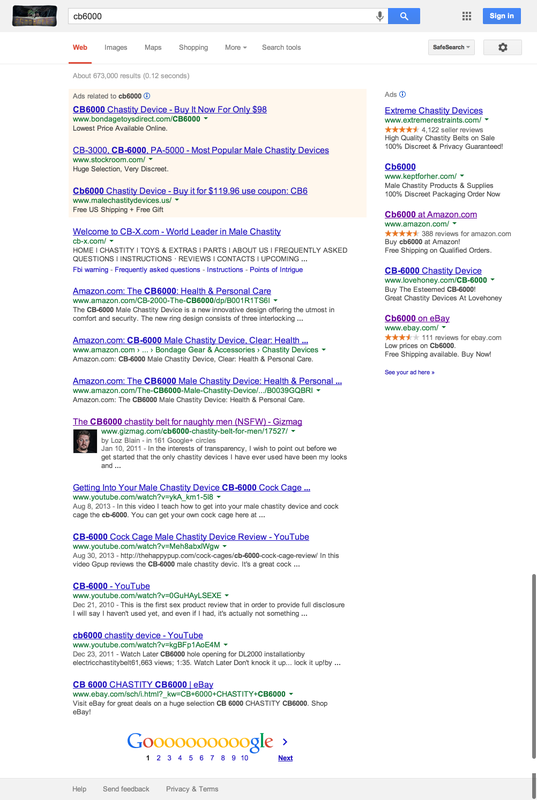 Yahoo’s results are powered by Bing and both sites ignore my page for that search query. Is this where I kink on the inadequacy of my daily hit numbers? I’m getting 20 a day or so, almost all of which come from Tom’s aggregator, with a smaller number coming from the liked links here. Nothing from Google at all, according to my site stats. You don’t monetize your blog, and big, big kudos to you for staying away from that. If your ego can stand the Google-blow, everything should be just as keen past-Googlecalypse as it was before. It’s *kind* of an ego thing, but mostly, the more I think about it, it’s a “why did Google do that” thing. They only succeed when they show people the most relevant results to their searches. I guess you could infer from this that they found people searching cb6000 wanted to buy, not learn. I don’t know what else to make of it. WRT to monetization, I’d rather have a pleasant site experience than generate a few shekels from my readers. WRT to building traffic and visibility, I’d say you’re on the right path. We are all descended from Tom, after all. I’m locked and loving it ! It’s been a few years since I was last locked. My wife’s just not all that interested in engaging. I knew my wife was going to be out of town tonight, so yesterday I decided to give it another shot. I sent her a text and commented that it might be good for both of us if I was locked while she was out of town. My hopes weren’t very high, but when I woke up this morning, my key was sitting next to my sink in our bathroom! Maybe our relationship is taking a new turn! I am more interested in consistent readership and developing a relationship with my audience than in the one-hit-wonderness that Google brings. I wrote a post about my Sybian experience, and that post brings many comers (heh) ~ sometimes hundreds per day ~ but they read it and leave. So the numbers are not really indicative of overall reader participation/investment, or of whether any of my *regular* content is valued by my readers. Just a comparative two cents. I don’t disagree. It’s why I don’t use generic tags like “blogging” or “Google” on posts that are less about what I usually talk about and more about other things. I don’t want to lure someone here who would take offense at the content and/or would find it totally uninteresting. However, how to wear a CB-6000 is totally germain to what this blog is about. If you’re searching for CB-6000 content, I think that page would be something you’d really like to see (at least, I hope so). And if it is, it’s likely you’ll stick around and read more stuff. Two shekels. Two tacos. Two…late!